National Interview Day is coming up next week on Aug. 9! To prepare for the big day, we’ve compiled a list of our top interview tips. Practice makes perfect, right? This mantra doesn’t just apply to sports’ it applies to interview, too! If you’ve never had an interview before, your first one probably isn’t going to go very well if you don’t prepare in advance. To avoid that, practice interviewing with professional groups, friends, and family members. Also do all of your research on the company ahead of time. Have some idea of not only the position itself, but also the company’s culture and mission statement. Be sure to brush up on projects the company has done recently to sprinkle into the conversation. Come to Express for National Interview Day! 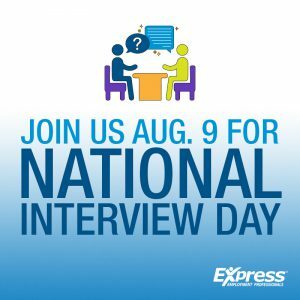 Apply now to join your local Express Employment Professionals office for National Interview Day on Aug. 9, 2018. Applying online will expedite your interview process and allow us to schedule a time for you to interview. Applicants are contacted for interviews based on the time of your application and the type of work you are seeking. Express can help you find the type of job that fits for your needs and abilities, and you’ll never pay a fee for our services and support. Express matches job applicants with the needs of our client companies. Previous Post Poll Question: How Much Influence Did Your Parent(s) /Guardian(s) Have on Your Career Path? Next Post The 2018 Job Economy So Far: Will You Find a Job? Where are the interviews being held? At a participating Express office! Check out our office locator and find an office near you. Very informative post. Good job!